Get to know a single dashboard for your all WordPress sites that will help you understand your data and make more informed decisions. Running multiple sites is a trying endeavor. Keeping track of different aspects of different sites is a real chore. Monitoring how well those sites are doing is even harder. When releasing content or goods you’re usually doing so with a clear content-to-site connection, making it less confusing, but when you want to gather relevant stats for better optimization you’ll find you have your work cut out for you. Having multiple #WordPress websites may help you decide to pull your hair out. With @wpdriftio, you will be able to manage those sites more efficiently and keep sanity (and your hair). Jumping from site to site can and will get tedious in no time. This is why using a platform like WPdrift.IO can save you time by bringing all your sites under one roof giving you access to all the information in one place. As we’ve already briefly mentioned, WPdrift.IO is a platform, more precisely a dashboard, that unites all the statistical information from all the sites you run making it far easier and quicker to gather all the info and put it to use. It’s primarily oriented towards commercial sites (mainly sellers), but anyone with a WordPress site can find a use for it. Now it’s important to note, so as to avoid any confusion, WPdrift.IO gathers stats on your sites, users, customers, products etc. but you can’t edit your sites through it – it will not replace WordPress as your editing platform. With that in mind let’s go through all it can do. When starting WPdrift.IO you’re greeted with a refreshingly simple and clutter free Dashboard that gives you some basic information right of the bat. On the left side, there is a small tab with which you can go into more detail regarding certain features of your site. Finally, on the bottom left there is the site management button and on the upper right your account management drop-down menu. That’s really all there is to it. You’ll be able to use all the features in a flash, even without prior knowledge of the platform, or managing site in general for that matter. 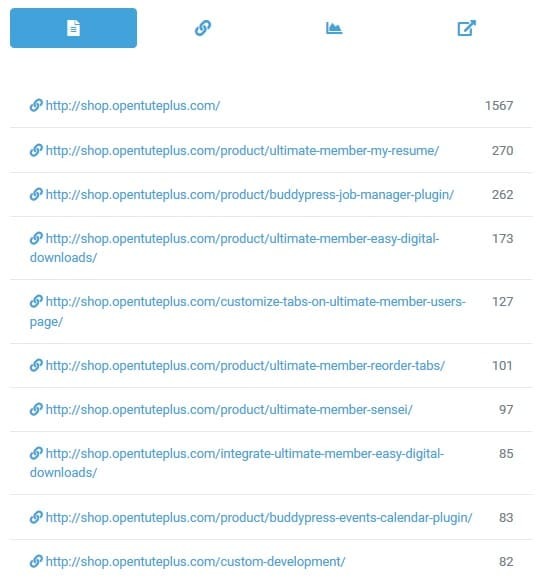 The core window of the dashboard reveals some core stats for you to browse through such as the number of posts, pages, comments and customers throughout a given time period. These will help you track the flow of popularity and relevance of your site. If you spot a trend that keeps occurring – for example, there is enough posts, pages, and users, but not enough comments you can modify your content accordingly in order to spark a conversation between your visitors. If the same problem is viewed from a webshop point of view, you might like to encourage customers to leave reviews (award them with small discounts if they do, or something similar). These stats won’t blow you away by any means, but they’re certainly important to keep an eye on when you want to have a good site. 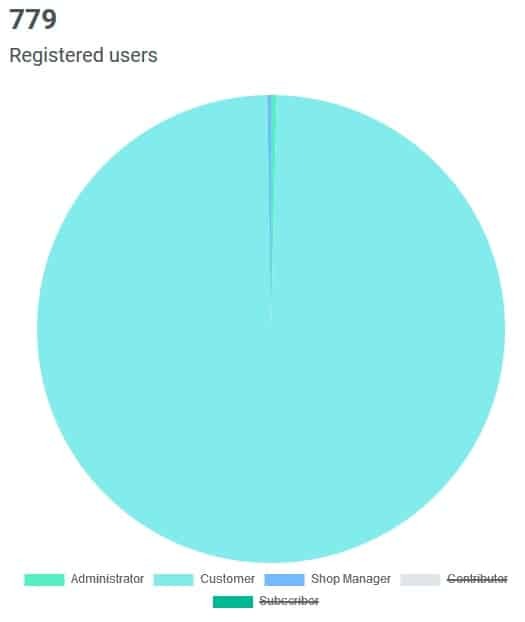 Moving on down you’ll be shown the user diagram depicting the fluctuations of new registered users. This can help you with building marketing strategies – you notice an uptick in registration around the holidays in December, but lower rate during the summer. With this information, you can either up your marketing campaigns in summer months to get more people to join, but at the same time focus your content output during December because of the higher volume of users seeing it. Not will you be able to track new registrations, but you’ll get to sort them all. All the registered members are further divided into admins, customers, subscribers etc. and you’ll get to see the full breakdown in a handy pie-chart. 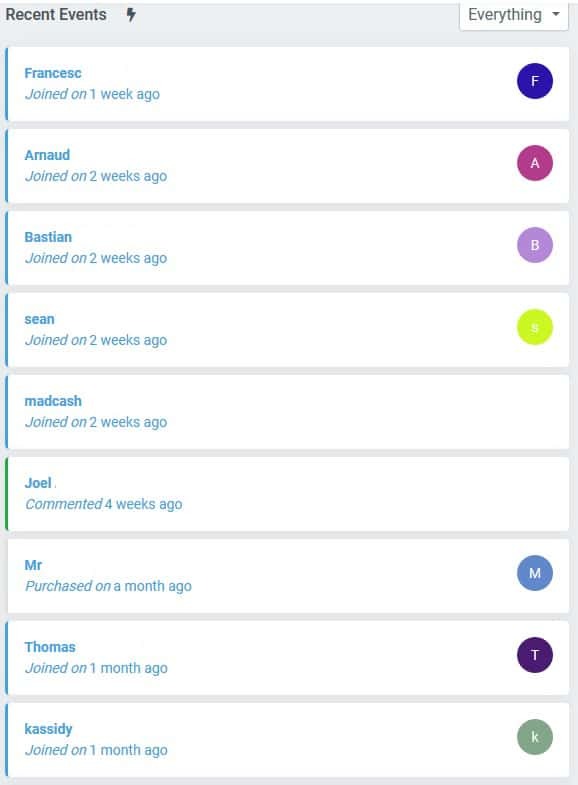 Aside from the obvious advantage of knowing your membership structure, you’ll be able to monitor the ratio between the roles making it easier for you to make adjustments (no sense having 5 admins if you have only 35 registered users). Recent events, much like the name suggests will track anything and everything that occurs on your site and act like a log. The log will include information about new registrations, comments, purchases etc. This kind of log can be helpful simply to be in touch with all the ins and outs of your site at all times. Knowing what is popular and trending on your site and what is lacking is essential for a good business. WPdrift.IO puts a section dedicated to this front and center. Check the popularity of every page, where your referrals are coming from and how many clicks your links are generating on other sites with just a few clicks. You’ll no longer be estimating how your marketing campaigns should look. Now, with all the info you’ll ever need at your fingertips, targeted campaigns are a synch to pull off, therefore cutting your costs and rising your profits – who doesn’t want that. 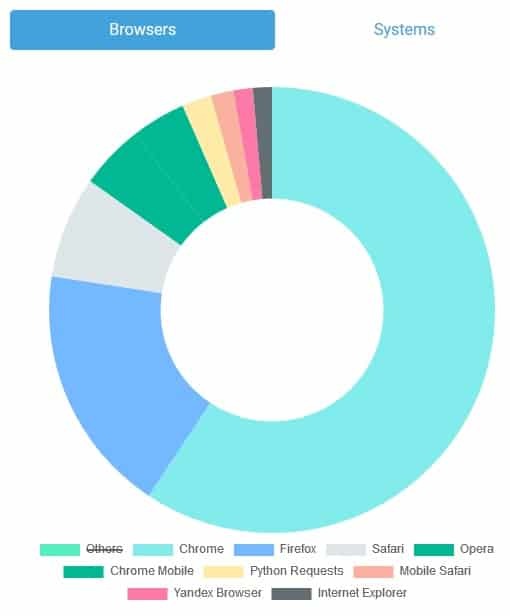 Last, but not least, a spot on the home page is reserved for letting you know what browsers and systems your visitors are using while on your site. Although not essential information like some others we’ve mentioned it’s nice to know for subtle tweaks to your content output. Say you’re running a webshop where most of the visitors are using mobile devices for browsing through your wares. It could mean that cell phone accessories could sell well. Maybe even expand the selection for a particular brand if you’re able. Like we said – not crucial info, but nice to have nonetheless. Moving on from the dashboard we can get into more specific things you’ll get to follow. First and foremost is the orders – the most important part for anybody who hopes to sell stuff. Without orders there simply is no business. Here you’ll be able to track all orders made on your site, their status, the customer who made the order, the number and cost of items bought, etc. This feature really isn’t anything fancy but is so essential to the core business that you simply can’t be without it. Check this tab often to be in the loop and follow what items are selling better and what items are selling worse. Influencing the latter to improve can be a make or break move and as such shouldn’t be taken lightly. Inform yourself as much as you can before making any decisions! Getting to know your users and customers can immensely help you build up your business. Whether it’s their purchasing trends, or even just geographical location going the extra mile, for your top customers at least, will only benefit both them and you. Keep in mind that not all users are necessarily customers, but since they’ve already seen fit to register can become so most surely. Catering to potential customers and keeping the ones you already have is another core part of a successful business. Since all orders are logged it really isn’t a stretch to expect they directly tied to the customers. You’ll get to keep track of all bought items and money spent on the general list. Going in further into their profile details those stats are once again presented in more detail (every order separately), but also get to know their status, contact information currency they used etc. All of this can be crucial in retaining or even expanding your customer/user base. The final tab (not counting settings) is the product tab. Here you’ll find everything you need about all your products – when they were released, how much items they’ve sold and, of course, how much profit they’ve generated. An overview like this lets you know where you should focus your attention to maximize the profit. This can also be a solid reference to cut something from your offer if it proves to be constantly underwhelming. Again, like so many cases here, WPdrift.IO will provide you with the information you need, it’s then up to you to what you’ll do with that information. 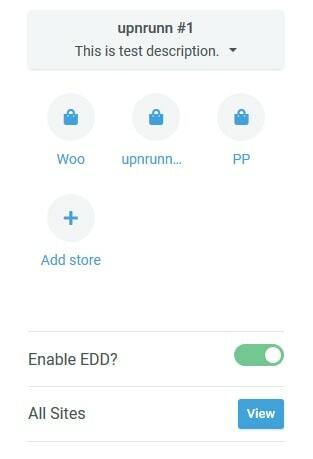 On the bottom, we’ve already mentioned, is the “switch site” control. This is the really cool thing about WPdrift.IO – with just a few clicks you can go through all your sites and the content and stats you’ll get back is processed instantly giving you quick and easy access to everything you need in one package. 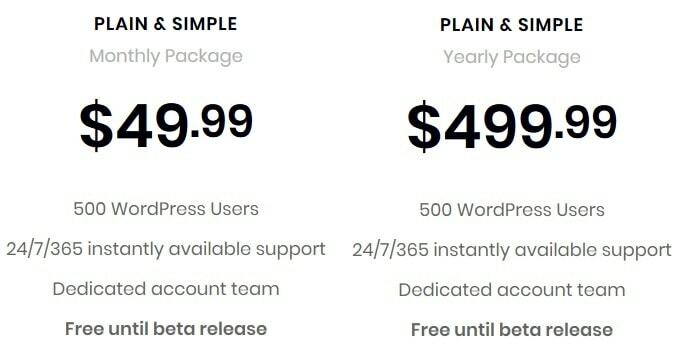 As of writing, WPdrift.IO is still in its beta stage, so pricing options are susceptible to changes once the full version is released. Right now, however, you can try it for free and get a 14-day free trial to test everything out and there are two price plans available – one with monthly payments and the other with annual. As you can see, there are certain benefits with going for annual payment – you get two months for free, so if you’re planning on using WPdrift.IO yearlong this is the way to go if you want to save some money. Running a store, big or small, you’ll need all the help you can get. Running multiple stores, you’ll be searching far and wide for something, anything to make your life easier. WPdrift.IO is one such tool – it makes data collecting unified and easy leaving you to focus on more important things all the while supplying you with the aforementioned information to make the important decisions right. Because of this, we can highly recommend it. Published on December 3, 2018 by Matej Milohnoja. Filed under: business, review, WordPress.